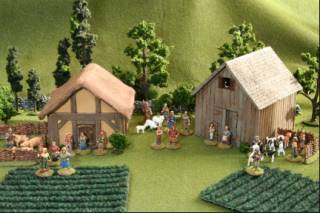 Here are a few photos of a wonderful little village in the Dark Ages, circa 900 A.D..The goats have been milked and the pigs are in their pens.The farmers are tending to the cabbages.People talk and enjoy the slow life.The shepard is tending to his flock. The peasants are Gripping Beast andthe vikings are Black Tree Design 28 mm miniaturesI base them on metallic washers so they can be magnetically based and grouped.The house is partially scratch built, partially Hirst Arts blocks.The barn and stone walls are Armorcast resin.The fields are simple doormats.The trees are mostly Woodland Scenics.All figures are painted with Vallejo and Foundry acrylic paints.in the near future. Suddenly, the viking Bondi attack!The bowmen approach from the left.Crazed axe bearers approach from the right.And a large contingent of spears and swords charge up the middle. The village is taken completely by surprise.The animals are slaughtered.The men are killed like fleeing rabbits.The women are enslaved and held captive in the pig pen. Lord, save us from the fury of the norse men. 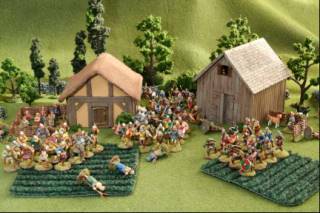 Thanks for reading about my 28 mm vikings.There will be more photos placed here as the restof the viking attack force assembles. Last modified: Thursday, 09-Jun-2011 12:53:20 MST.